The Better Business Bureau reported recently that although the number of consumers writing checks is decreasing, the amount of fake check scams is rising. One of the major problems with fake checks is that it can take weeks to find out and then you’re on the hook for any funds drawn. 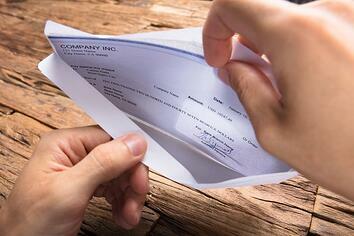 Here are some signs that you may be involved in a fake check scam. In this case, you will be sent a check for you to deposit into your account. After shopping, you are to wire some of the money back and then keep the rest. Once the fake check is discovered, you will have to pay back anything you have drawn on. While Secret Shoppers is a real program, you need to make sure that everything is legitimate beforehand. For example, a Secret Shopper program will never send you a check prior to you being employed. In this scenario, the victim is selling something online and receives a check from the fraudster for more than the sale price. The fraudster will have an excuse as to why the check is more and will ask the seller to deposit the check and then wire the difference back to them. If someone you don’t know is asking you to send money in an unusual way, such as wiring or pre-paid debit cards, this may be a sign of a scam. Once money is wired, it can be extremely difficult to trace and with pre-paid debit cards, there is no way of getting that money back. You’ve been informed that you recently won a foreign lottery. You’re sent a check that will cover the cost of the taxes and fees. All of you have to do is deposit the check, wire the fees back, and then you’ll be sent your prize money. Sound too good to be true? It probably is. Be wary of any contests that make you pay for your prize, especially when they are located out of the country. Ask for checks to be from local financial institutions when selling something. If they can’t or they live out of state, contact the bank where the check is from to make sure it’s legitimate. Suggest alternative methods of payment, such as Venmo or PayPal. If the buyer suggests a service you’ve never heard of, do your research. Don’t accept checks that are written for more than the sale price, even if the buyer seems to have a legitimate story. If they refuse to write the check for the correct amount, end the transaction. Trust your instincts. If an offer seems too good to be true or you feel pressured to “act now”, walk away.